Hi Star Wars fans! If you are in the city this weekend, you should check out the happening over at Zeum. 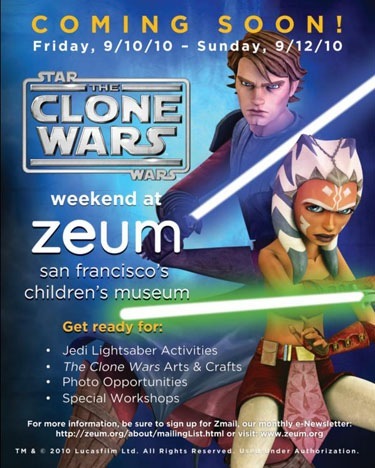 At this event, you can train with Jedi Master Obi-Shawn (I giggled a little), learn to wield a lightsaber, meet your favorite Star Wars: The Clone Wars characters and create Star Wars stories! I’m not sure whether there will be food, but I know it will definitely be an awesome photography opportunity.